Updated! A Mini Office is essentially a reference file or folder with all a child’s personal important information right at hand. This could be reference charts, handwriting charts, number lines, multiplication tables, vocabulary lists, handy facts and any other useful information. It is a handy way of encouraging children to work independently and to provide the necessary assistance without having to put up visual displays. 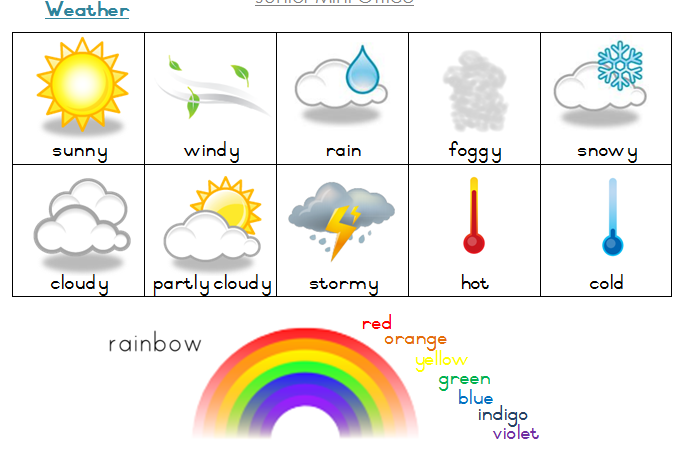 Weather symbols and Rainbow New! 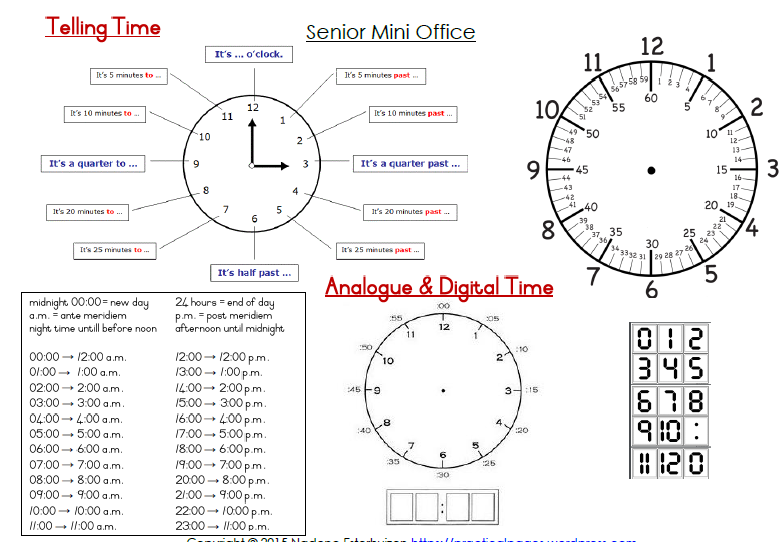 Telling Time , Clock face, Analogue & Digital Clocks New! Different types of fractions & Converting fractions Updated! Weather symbols & Wind direction & speed symbol & Celsius/Fahrenheit New! Paste onto card stock or a file folder or lapbook. My senior children used a plastic display file folder. LAMINATE! It will last for years. Use whiteboard markers on your laminated surfaces. Keep handy in the child’s maths books, notebook or ring binder. This is a 1 page-does-it-all-in-one chart all assembled with rotating circles and slide bars instead of fiddly flash cards, pictures, Velcro and all those other bits & bobs! Once assembled, the circles rotate and viewer slides to show the right pictures and information. Easy as pie! 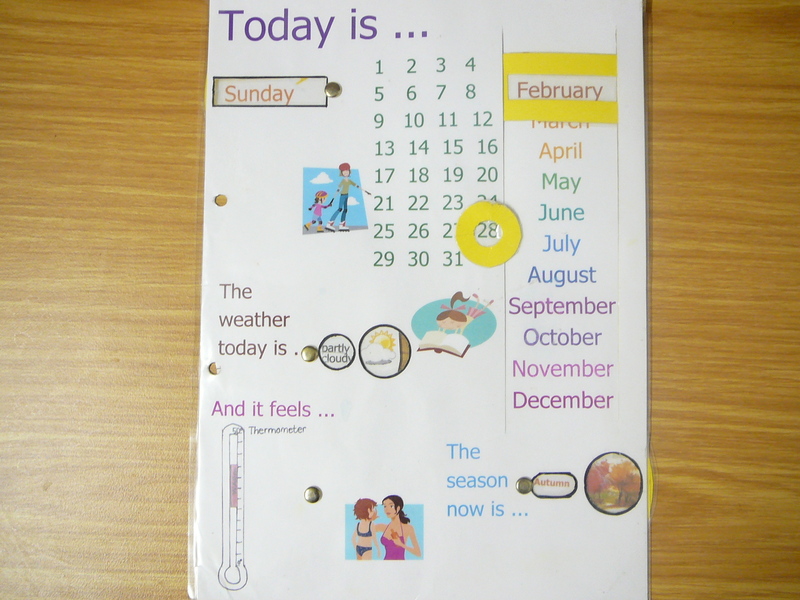 The child just checks the date and places the little yellow circle over the correct date, moves the circles behind the chart to show the correct day of the week, season, weather and temperature, and slides the bar to show the correct month. 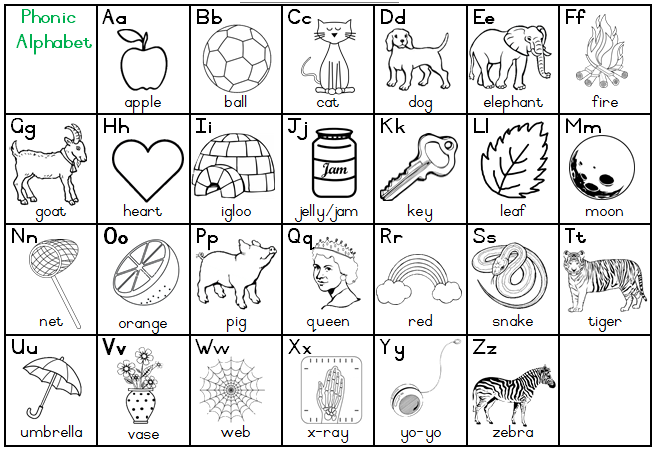 This chart maybe placed in your child’s file or added to your junior mini office! Then cut out all the windows on the chart, the season, weather, temperature, days of the week and date circles and the sliding month bar. Laminate the chart and all the circles and sliding month bars. Pierce the holes for the split pins or brads as indicated with black dots. Attach the 2 cardboard strips at the top and bottom of the month column with clear packaging tape. Insert the window bar from the front through the slits and wrap it around the strips and stick ends together at the back. It is really worth laminating this chart when you make it! We have used our chart for over 7 years and it is still as good as new! This is really neat. I have been trying to find a way to teach my youngest this information but the chart wasn’t working at all. I couldn’t get things to stay up without a TON of velcro. This may be the perfect solution! Thanks so much for sharing this!! I have not been able to find such a comprehensive set of charts for the older students anywhere else!!!! Thank you so much! This is so awesome. Thank you !! This is truely heaven sent. Again thank you. This is amazing! I am so grateful for all of your invested time for organizing things for us!!!! I have a question – what is the second language you translate numbers and such into? I am in the USA and this would be fun to learn a new language that we will see often as we watch you posts come in and use some of your material. I so love your postings and ideas. @Ann, we learn Afrikaans as our 2nd language in South Africa. It originates from the Dutch who first settled here. Many Dutch and Afrikaans words are quite similar! Funny I found that out from my Pastor last night as I was telling her about your blog and how I was going to hopefully teach my daughter this cool new language … My Pastor has been to Africa and wants to retire there when she’s no longer actively preaching (she’s young so it’ll be decades) but she was able to tell me the language and it’s history. Now I am even more excited to learn more of this language as something different than the usual Spanish or French. Thank you so much for sharing these mini offices. My husband has had three strokes in the last three years and has difficulty remembering the words he wants or the date, day of the week, etc. I’ve had trouble finding reasonably priced visual aids for him. Some of the pages I’ve printed and laminated for him. He can easily mark the day of the week, etc. with write-on, wipe-off pens. Other pages are helpful as a quick reminder of a word he is having trouble remembering. This has made such a difference in his level of frustration. THANK YOU!!! Nadene, these charts are excellent! I am so glad I found them. Thank you very much for your time saving and very creative ideas. I couldn’t help but read Ann’s reply about learning Afrikaans – do you know that there are literally thousands of Americans who are tought Afrikaans in some of the schools? And I am not talking about immigrants from here. I heard it over RSG radio station one morning when they spoke about how overseas visitors saw/experienced South Africa. @Elize, thanks for your encouraging comments! I had no idea so many Americans learnt Afrikaans! These are perfect! I am building a “mini office” binder for my 9 year old. Thank you for sharing. You are one fantastic lady! thank you for all your help! Thank you so much! After retiring last year I am now doing remedial teaching I have been teaching grade one for twenty years. Now teaching grade four Maths to a profoundly deaf little girl. Your charts are fabulous! Thank you for sharing. Wow! This is amazing! Thanks so much for sharing. I will definitely be using this for my kids! Super kid friendly! Thanks! My children love setting up office spots to do their work. Thank you VERY much for these amazing resources! They are exactly what I’ve been hunting for! 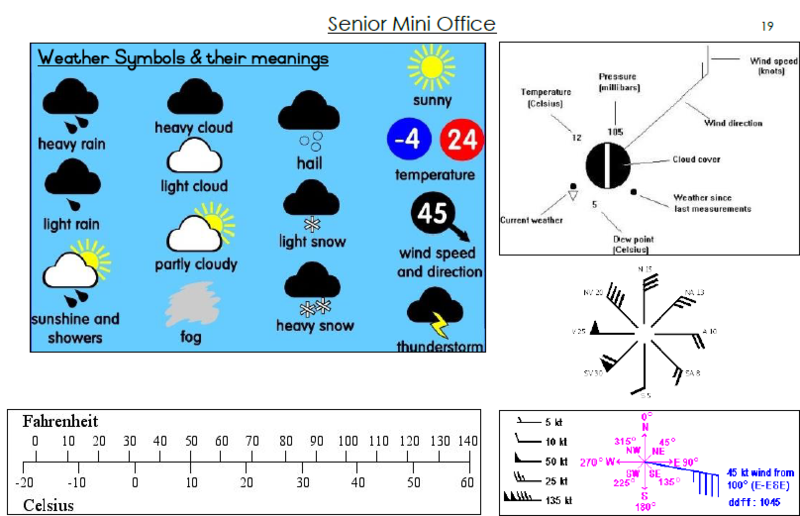 Random question: Am I missing something or is the 11 missing from the number charts (on both Junior and Senior Mini Office)? Well spotted, @Angie Dorn! I have corrected the error and completely updated the Junior Mini Office! Go get your free download!